To come and conquer me. Or there'll be a big, big price to pay..
Cuz I am the one you should fear the most..
Cuz I am the one who will take you..down. And as long as I exist.. It's what you want, well then okay. That a mouse will seem like stories tall. It's what you want..good bye! Yes, I am the one who will bring you..down. Never a time, I fall apart...I must be strong. Cuz the winners win, the losers lose. Choose your sides...it's your move..
And I am the one you should fear the most..
Cuz I am the one who can bring you..down. Check rate, out of control.. There's something on the highway movin.. There's something that's movin high and fast.. I know what to tell, what it is, where it's for.. There's nothing that's winning without us.. I'm speeding faster, turbo blaster..
Yeah yeah yeah..go go go! we are at top speed tracking you down. There's no one more powerful in the world but us..
now it's turbo time..turbo time, turbo time! Ya better run away when you're all alone.. There's something in the air, that keeps us going on and on and on..
We have the power inside us. We won't let evil inside us. We are strong, we are tough, we're invincible. We are here, we are now, we're invincible. We are here, and as one, we're invincible! They set their aims to destroy us. I'm sure they love to annoy us. We are strong, and we are tough, and we're invincible. We are here, and we are now, and we're invincible. We are here to help you with your attitude. Cuz ya think you're so bad, you're think you're so tough, huh? Ya better wave the white flag, or it'll be the end of you..
We're here to save the world. We're here to save the world tonight. Save the world..from your kind. Save the world..so now it's time..to unite! Did you really think you had a chance? Did you really think that we would fall apart? Ya think ya have a brain, but you're nothin but a dummy! Ya better run run now, or it'll be the end of you..
Save the world..so now it's time..
To unite..to unite..to unite..to unite..to unite..to unite..to unite..to unite..
Time to make your move..
You'll fall, that will prove. And ya think you're gonna knock us out? C'mon and let's rock 'n roll! It's time to rock 'n roll! Do you want to take our world by force? We won't let you complete that evil course. And ya think you're gonna take us out? Hey hey! Ya got it all figured out! And ya think ya got it all figured out? Wind in my face, I've got the sky in my sail. Flyin high, I could ride all night.. If you got the guts to turn the road into a flame..
Tire tracks will lead you to a perfect form! Burnin rubber, now that I can finally get away..
Make the mountain higher, enough to make me change my ways..
Tightenin up my grips so I don't go into a spin..
Watch out when meteors explode! Thunder cracks whenever worlds collide! 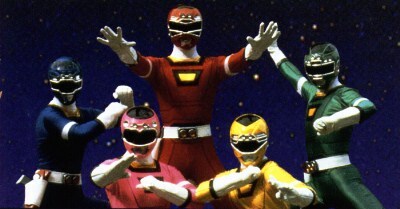 Go go Power Rangers...Zeo! Power Rangers! Well don't ya know that it's up to you?! You gotta do what you can do! You gotta stop them, stop those villains! You better make sure you can last. Ya gotta stop them, stop those villains! The Zeo Rangers are here. Come face them if you dare..villains..now! Ya gotta take em out with just one chance. Are ya ready, are ya ready to act?! Their evil hearts are power packed! Come face them if you dare..
Go with power to burn! Here comes the power again..
Help is coming your way.. But the power's here to stay! Watch your back, cuz here they come for you.. They won't stop until you're through..
Zeo Rangers are here today..
Don't give up until they're gone..
To defeat them, stand and you'll go on..
You are visitor # to "Turbo: A Power Rangers Movie Soundtrack Lyrics"